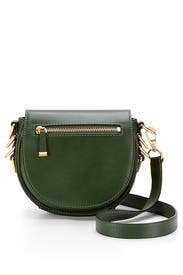 Green leather gives a unique twist to this Rebecca Minkoff equestrian-inspired bag. Forest green genuine leather saddle bag with custom brushed hardware. Three interior slip pockets and one interior zipper pocket. 23" adjustable shoulder strap drop. 7.75"W x 9"L x 4.25"D.
Perfect little purse! Deep green than expected! Great little purse. Rented for vacation in Ireland - needed green! I was expecting a slightly brighter green but it was more hunter. Just keeping my phone and essentials in here; love carrying this little bag around. Feels so much freer than my normal large totes. This bag is great and fits all the essentials! This purse is really cute. The color is a nice, rich, hunter green and I love the gold hardware details. It is small, as other reviews have said. I got as an evening bag for two parties and it was perfect. My phone and Chapstick fit in the main compartment while my ID and debit card fit in the front zipper compartment. Felt great wearing this purse! Definitely pulled my outfit together. 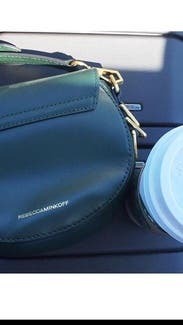 I rented this purse for my birthday, my husband took me to Wicked and it was the perfect fall color and so fitting for Wicked! It's small, but very roomy, and great quality! 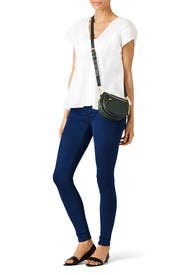 This was a great cross body bag for going out at night, but not great for everyday because it was soo small to fit my wallet or sunglasses holder. I wish it came in a slightly larger size because I love the color and shape! Really enjoyed having this little guy around for a bachelorette weekend! Although small, I was absolutely able to get my phone, lipgloss, keys and cigarette wallet with cards/cash all inside easily. It's a stunning olive/forest green that really does match everything and has a light but edgy feel to it. Keeping this in my back pocket for another rent! Such a fancy little bag! I rented this to carry around over my birthday weekend. The bag is made of high quality leather and has a great sturdy shape to it. The size was as expected; big enough to fit my phone with a bulky case on it and even my sunglasses case. Only con is that it doesn't have a really secure place to hold credit cards or cash, but as long as you stick them in the small sleeve in the main compartment you should be good! The green was much darker in person--almost looked black in low light. Perfect size for a night out with friends. The color is a lovely green (not sure why others thought it was black). I received MANY compliments on the color. You can fit a phone, some lip gloss, and maybe a small wallet but that's about it. Then again, what else do you need! Great color and Perfect size! This RM bag is the perfect size for a cross body bag. I rented it for a football game where you are not able to carry in a large purse. I was concerned my phone would not fit in it but my iPhone 6 with an Otterbox Defender case fit along with keys, lipstick, powder and a small zipper pouch for a wallet. 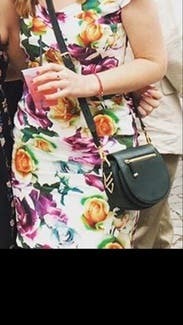 I wish I could have actually wore this bag. It's so cute and goes with all things neutral . Great bag! The gold isn't really my style but it was cute and convenient nonetheless. This purse has a longer than expected strap, so it hits around the bottom of my but. Loved this bag. Loved the color. Really great weekend brunch or evening out.